What is a leader? What do we want and expect from leadership? What do we need for leadership today? 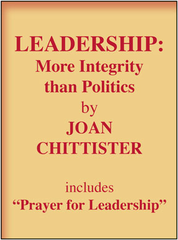 Joan Chittister addresses these questions in a new eBook, Leadership: More Integrity than Politics. 10 pages This ebook is a downloadable PDF file.